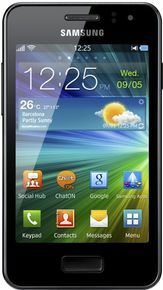 Samsung Wave M S7250 is currently not available in any stores. 480 x 320 px Video Rec. Watch your favourite video songs and movies in video player. It supports MPEG4, H.263, H.264, DivX file types. Listen to your favourite songs in music player. It supports MP3, AAC, AAC+, eAAC+, WMA, WAV, AMR, MIDI etc. file types.